Market research firm ComScore is back with the latest numbers on the battle for consumers’ hearts and minds in the U.S. smartphone arena. On the positive side, Apple's share continued to grow, holding steady in second place after BlackBerry-maker Research In Motion (RIM). However, Apple’s rate of growth appears to have slowed. From October 2009 to January 2010, the iPhone’s share only increased by 0.3 percentage points; from September 2009 to December 2009, comparatively, it had increased by 1.2 points. Don’t let the slowing in growth fool you, though: Apple still holds a very healthy 25.1 percent market share behind RIM’s pack-leading 41.3 percent. Meanwhile, Google’s Android platform is the big mover and shaker, having jumped from a 2.8 percent share in October 2009 to a 7.1 percent share in January 2010—an increase of 4.3 points. Of course, Google has introduced a number of new Android models in the last several months while the iPhone product line has remained unchanged since the introduction of the 3GS in summer 2009. 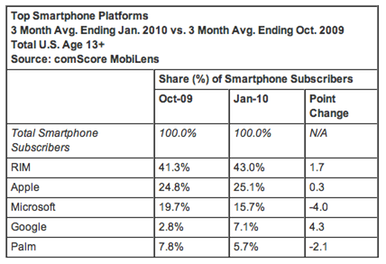 The rising smartphone tide has not, however, lifted all ships. Microsoft continues to hold third place in the market, but the company dropped 4 points since October 9, its share dwindling to 15.7 percent. And Palm has lost traction as well, dropping 2.1 percentage points to a 5.7 percent share. However, the January 2010 numbers do predate both Palm’s plan for a renewed marketing push and Microsoft’s introduction of the new Windows Phone 7 Series, so this probably isn’t the final word for either company.